Hundreds of of Kichwa indigenous people living along the River Tigre in the remote Peruvian Amazon are demanding over 100 million Peruvian nuevo soles ($32 million / £21 million) from oil company Pluspetrol in the “environmental damages” they have sustained over 40 years of oil drilling. The Kichwa men, women and children blockaded the River Tigre for most of January with two cables – stopping two boats contracted by Pluspetrol to carry equipment, materials and supplies upriver to oil dilling sites. The blockade was only suspended last Friday after Fernando Melendez Celis, President of the vast Amazonian region of Loreto, paid a visit to the protesters, camped by the side of the river on land belonging to Kichwa community Nuevo Remanente. The blockade is the latest manifestation of a new activism among the indigenous peoples of the Peruvian Amazon. 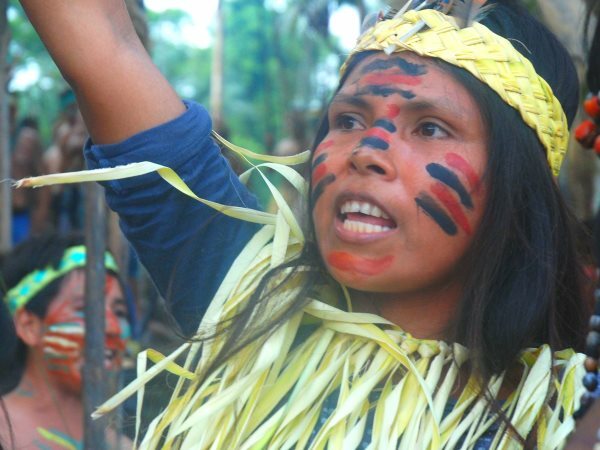 Last December the Matsés people whose territory straddles Peru’s border with Amazonas, Brazil threatened at attack any oil workers entering their lands. 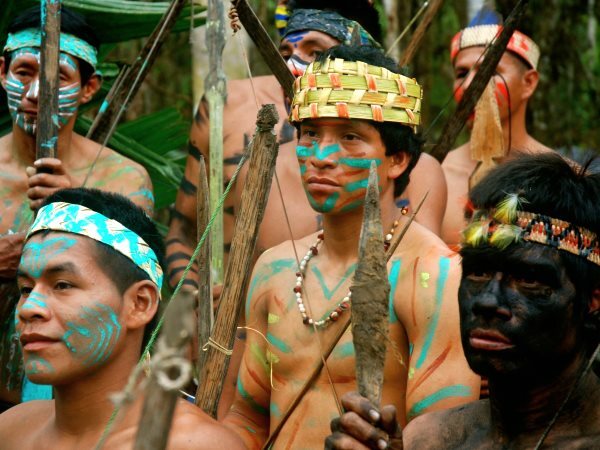 Kichwa warriors at Rio Tigre blockade, photo by David Hill. Pluspetrol’s concession, Lot 1-AB, is Peru’s number one oil producer. Operated in partnership with PetroChina, it yielded almost 25% of all Peruvian oil in 2013. But operations there have led to severe contamination leading the government to declare an “environmental emergency” in the river Tigre basin in late 2013. Water samples from the Tigre and its tributaries revealed dangerous levels of lead, nickel, iron and aluminium – leaving local communities no water fit for human consumption. The Kichwas are also demanding compensation for land use, environmental clean-up, and to be consulted by the government about the concession contract which expires this August, among other things. Numerous Kichwas say that the Tigre and other water sources are contaminated, meaning that they, as well as the game and fish they depend on to survive, are slowly being poisoned. 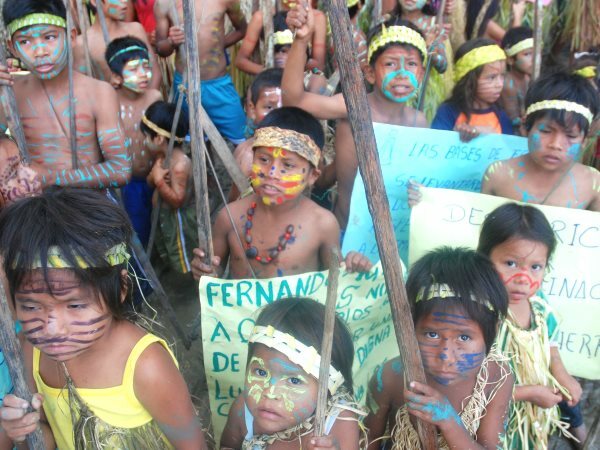 Kichwa children at Rio Tigre blockade, photo by David Hill. The blockade was suspended after Melendez Celis agreed to broker a meeting in the nearest city, Iquitos, between Kichwa leaders, Pluspetrol, and the central government’s Council of Ministers (PCM). And on the same day that Melendez Celis set off for Remanente, Peru’s Energy Minister announced that the government will invest 100 million soles in the Tigre and other rivers where environmental emergencies have been declared, with the funds directed towards environmental clean-up, drinking water systems, electrification, land-titling, health and education. Calls were made by satellite phone to Pluspetrol and the PCM in Lima, and Melendez Celis committed to attempt to ensure that Peru’s Prime Minister Ana Jara would participate in the meeting too. A PCM representative present in Remanente at the same time made various proposals to the Kichwas, including 3.5 million nuevo soles for land-titling, but they insisted on dealing with higher-level personnel. Melendez Celis also committed to ensuring more oil revenues are invested in the Tigre region, and to paying for studies estimating the financial value of the environmental damage. If our demands are not met, the blockade continues! Posted on February 12, 2015, in Oil & Gas and tagged FECONAT, Kichwa, native blockades, native protests, native resistance, Peru Amazon, Peru Indigenous, PlusPetrol. Bookmark the permalink. 3 Comments. Talk is cheap. When they actually do something is when I’ll believe them.